Logo design for this native Hawaiian solo-preneur in San Leandro, just outside of San Francisco, CA. Aloha Pet Services’ slogan: When you say good-bye to your pets, we say hello! Unique circular business cards to commemorate ten years in business (2013). Congratulations and best wishes for continued success, Sabrina! When you say good-bye to your pets, we say hello! Special thanks to Jeff Jones Illustration for the adorable dog and cat illustrations. To commemorate Sabrina’s 10th anniversary these unique (3″ diameter) circular two-sided business cards were created. I’ve had the pleasure of working with Lori when we were both employed at The Phoenician resort in Scottsdale, AZ, which was one of Sheraton’s Luxury Collection properties. The Phoenician had exacting standards for their print collateral. Lori was the only in-house designer out of 1500 employees, consistently delivering quality projects for the many in-house clients, meeting with them, designing for them, and ensuring final printed pieces met those high Mobil 5-star standards. 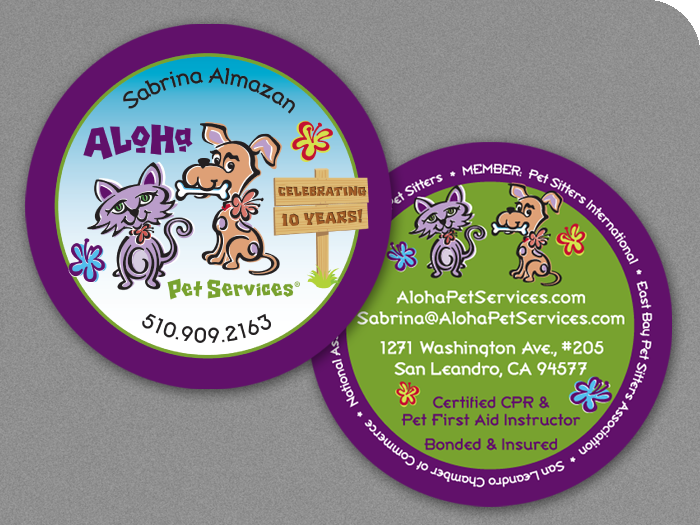 When it came time to start my own business, Aloha Pet Services, I was grateful to have my branding and new website in such capable and creative hands. I highly recommend working with Lori — she’s “No Ka Oi”!